Every evening during the European meeting, Brother Alois spoke at the end of the prayer. His meditations are published here. Our pilgrimage is coming to an end. When you go back tonight to the families who have welcomed you, tell them again our gratitude. Their hospitality will remain a light on our way. Let us take this light home with us tomorrow. It is the light of Christ himself. It will enlighten our everyday lives. It will rekindle hope in us over and over again. With this light we will pass through the darknesses that might discourage us. It will enable us not to give in to fear in the face of the instabilities and upheavals of the world. The light we have found here is a light of peace. Tomorrow will be World Peace Day. Tonight we are going to pray for all those who experience violence, injustice or poverty. On returning home, each of us can be a peacemaker, everyone can inscribe non-violence in their daily lives. Each of us could share the light of peace with one or several other people: our loved ones, a family that lives in a precarious situation, a homeless person, an abandoned child, a refugee. Sometimes we can relieve suffering. Always we can give our heartfelt attention to another person, which is as important as material help: listening to a refugee telling his story, or a single mother who is unemployed and who does not know how to prepare the future of her children . . . When we go very simply to those who are poorer than ourselves, we make a discovery: they give us something, they help us to accept our own weaknesses and vulnerability, they teach us the inestimable value of human goodness. The poor of this world are, sometimes unwittingly, very close to Jesus who was poor among the poor. When we open our hearts to those who are wounded by life, we draw closer to Jesus. At the same time we understand his words better, and his light is rekindled in us. The meaning of our life becomes more evident, it is a sign of the love of God, we are made to love and to be loved. And now I have one more piece of news to announce. There are among us young people from several countries in Asia. In a year and a half, it will be their turn to welcome a stage of our pilgrimage of trust. It will be from 8 to 12 August 2018 in the city of Hong Kong. Like all of you, we brothers, too, are going to return home to Taizé. But on the way we will stop in the two neighboring countries. A few brothers will go to pray in Tallinn, Estonia, others in Vilnius and Kaunas in Lithuania. The Baltic countries, though very different from each other, also form a unity. They do not forget that, in order to claim their independence, they once formed a human chain that crossed the three countries from north to south. We thank the three Baltic countries for their courage, their hospitality and, for many of their inhabitants, their faith. Thank you for the light that we have received here, it will guide us in the pilgrimage of trust in our everyday lives. Since we arrived in Riga on Wednesday, our meetings and our common prayers have been filled with great joy. At the same time, we are fully aware of the gravity of the political and economic situations in Europe and the world. Together opening paths of hope. More than just being a theme for our meeting, that is an experience we are making these days. The beautiful hospitality we have found at Riga nourishes this hope. I would like to say a big thank you to all those who have welcomed us to Riga: the families, the parishes, the authorities of the city and the country. The different Churches have joined together to receive us, Lutheran, Catholic, Orthodox, Baptist, Pentecostal, Evangelical. And I would particularly like to thank those who, without sharing the Christian faith, have also opened their homes. You Latvians, you have opened your houses and your hearts to young people you did not know. Among the gifts of your people, there is that of hospitality. Our meeting bears a message for Europe: we opt for a European fraternity that is respectful of local particularities, where the voice of every people counts. And we are committed to building bonds of friendship in Europe and beyond the borders of our European countries. For us Christians, fraternity has also another name, that of communion. Yes, Christ unites us in one communion, with all our diversities of Christian cultures and traditions. The year that begins will be the 500th anniversary of the Reformation. This gave a deep inspiration to the Church. But it also unfortunately led to a profound division. You, the young people who are here, Protestant, Orthodox, Catholic, testify by your presence to your desire for unity. You are right: we must be together so that the dynamic of the Gospel can be revealed. Like the story about the early Christians we read tonight, we want to be one heart and one soul. It is when we journey together that the hope that comes to us from Christ manifests itself clearly. He has conquered death and hatred, he unites us today in one communion of all the baptized. If we are united in Christ, we can be a sign of peace in a torn humanity. Yes, our fraternity, our communion can prepare peace. Tomorrow, you will share about the fourth proposal for 2017: Allow friendship to grow in order to prepare peace. With few means, even with almost nothing, each of us can be a peace-maker, nearby and far away. All humans, and even all creation, aspire after peace. Our attention to the environment also contributes to peace. And now I want to make a concrete proposal. Since my visit to Syria last Christmas, we have welcomed a Syrian family in Taizé as well as an Iraqi family from Bartella near Mosul. The children Manuel and Noor who are here beside me are from this Iraqi family. I keep telling them: God sent you to us. I have also kept in touch with some people in Syria. Last week I spoke by phone with a Christian community in Aleppo. In the midst of the terrible tragedy that the Syrian people is experiencing, there are those who remain unbowed and are doing all they can to alleviate suffering. So I said to myself: we have to support them. Through our Operation Hope, Taizé’s collection, we want to financially support this community in Aleppo in Syria and also a community in Mosul in Iraq. They care for children suffering from trauma, they contribute to the reconstruction of destroyed houses. By this they help people stay in their countries. You can find on the sheet that has been distributed to you how to participate in this mutual aid. In 2017 our pilgrimage of trust on earth will continue. 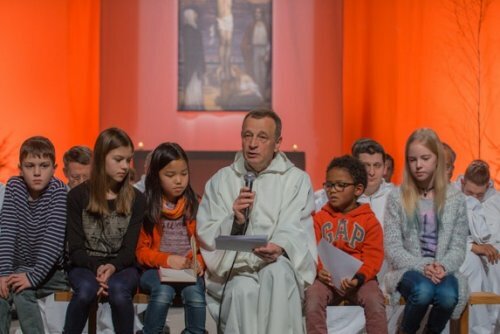 In Taizé there will be the meetings each week, with a special week in August reserved for young adults from 18 to 35 years, to allow them a shared deepening of their commitment. Elsewhere in the world, we will have meetings, among others, in Birmingham, one of the most multicultural and multi-religious cities in Europe; in Saint Louis in the United States where ethnic tensions remain high after the events of Ferguson two years ago; in Egypt where the Coptic Orthodox Church has recently had to suffer once again. In this anniversary year of the Protestant Reformation we will be hosting a prayer in Wittenberg, the city of Luther, in the context of the German Kirchentag, and another prayer in Geneva, Switzerland. We are being welcomed so well in Riga. Again we understand that hospitality is a fundamental and universal value. All humans thirst for communion, friendship. When we experience it our life takes on a deeper meaning. We would like to live such heart-felt hospitality not only in exceptional moments but in our everyday lives. And first toward those who are closest to us: taking time for them, listening to them, and also letting ourselves be welcomed by them. Then let us extend hospitality beyond those close to us. In these days we are listening to the testimony of people who go towards the poorest. Those people tell us how happy they are to be able to help others, but they also tell us about everything they receive from them. Yes, when we go toward those who are poorer than we are, even with empty hands, a joy is given. In Taizé we have experienced this often, and especially during this past year with the refugees we have welcomed. Being close to them in their distress, listening to their stories has led us to develop amazing friendships. Of course, the arrival of so many refugees who want to enter Europe poses complex questions and no one has easy solutions. But I am convinced that we will not find a solution without personal contacts. Without such contacts, fear risks taking over, which is comprehensible. Moreover, in all our countries for a long time populations of different cultures have been living side by side. There too, let us create personal contacts, bridges. Let us go beyond prejudices. Even with few means, with almost nothing, we can begin. Let us go toward others, in great simplicity. Today, the tensions and upheavals of our societies are such that we must make a strong inner decision if we are not to yield to discouragement. What decision? It consists, for us Christians, in plunging our roots ever more deeply into Christ Jesus. Faith, trust in God, cannot be a marginal reality for us. It means neither more nor less than putting Christ ever again at the center of our lives. In the Gospel this evening we listened to his words: "Go, sell all that you have, then follow me.” What a radical challenge! But it is not impossible. All of us can begin or begin again to practice this word of Christ. It is possible because, before he asks anything of us, Christ first draws us close to himself. He loves each and every one of us with an unconditional, even a crazy love. Even our faults do not diminish the love he has for us. Let us, too, welcome Christ with love. Let us offer him our hospitality. He beholds us with trust. Then fear gives way to courage. The impossible becomes possible. We welcome him in a simple and even poor prayer, in his word and in the sacraments. And we welcome him for sure also whenever we have a personal contact with one of the world’s poor people. Jesus himself said to us, "Whatever you did to one of the least of these, it was to me that you did it." Tomorrow you will discuss the second proposal for 2017. Christ invites us to simplify our lives in order to share. Yes, to choose a life of simplicity is a source of freedom and joy. We must not hesitate to make or re-make this choice without delay. What a joy it is to be welcomed in Riga! We have come from all over Europe, from Portugal to Russia, passing through Poland and Ukraine. Some have even come from further afield, from other continents, notably from South Korea and Hong Kong. Faced with the instability of today’s world, we need to come together in a great brotherhood that transcends borders. That Latvia, one of the Baltic countries, is welcoming young people from all over Europe, is a sign of hope that sustains us. I would like to say a big thank you to the Latvians. And I think I am doing so on behalf of all of you, surely? Dear Latvian friends, like the other Baltic countries, you are a small nation. By coming to you as pilgrims, we would like to indicate that, in the concert of European voices, your voice counts. By your warm welcome you make that voice heard throughout the continent. In the past you have suffered and you have loved. Those who are older among you can still testify to that. Your often painful history has prepared you to be a land of reconciliation, a bridge between different parts of Europe. We support the courage with which you respond to this calling. Together opening paths of hope - this is the theme of our meeting that begins tonight. I brought it back from Benin in Africa, where we had a continental meeting in September. With 7500 young people from different countries we experienced the fact that hope arises when we come together. Why in Africa? And why, in other years on other continents, has our small community of Taizé undertaken a pilgrimage of trust across the earth? One of the reasons is globalization, the interdependence of countries and continents. And we would like to contribute to a globalization of brotherhood. But this is not the deepest reason. Another reason is to be better able to listen to the youth of the various regions of the world and to uphold them in their trust in themselves, in their countries and in the future of their countries. But the most essential reason for us is in the faith that Christ came for all humanity, he wants the fullness of life for every human being. He unites us all in one human family. What I would like to convey to you from the African stage of our pilgrimage of trust is the vitality of the young people of that continent, their ability to persevere in trust even when the horizon darkens. And I would like to communicate an appeal that these young Africans address to Europeans: they ask us to bring about more justice in international economic and political relations. Faith, trust in God, is alive in Africa. We too, during these days in Riga, want to go to the sources of faith. You have received the four proposals for 2017. Tomorrow morning you will exchange on the first: "Stand firm in hope: it is creativity." To strengthen our hope, beyond a naive optimism, let us dare to believe in the power of the Holy Spirit. Let us lean on him, even if he is invisible. He is present in our hearts and in the world.